Hey Supporters, As you know I have a heart for foster-care and adoption. It was recently brought to my attention that a fellow blogging friend needs help raising money to adopt a little one. If you have a moment, please read below and consider supporting Merissa. Just last week Merissa, of Little House Living, shared that she and her husband were preparing for their first adoption fundraiser. The blogging community quickly shared their need for donated items and hoped that many of you would come alongside of them in that effort. But, to our surprise, Merissa announced on Sunday that they had just been chosen to be the parents of a healthy baby boy born on that same day (read the full story here)! Today the blogging community has the opportunity to come alongside of Merissa and her family as they adopt this precious baby boy into their family! 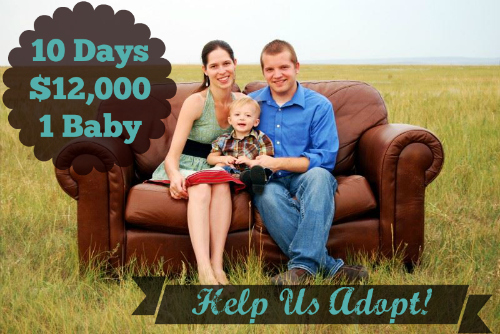 Merissa and her husband are traveling to pick up their new son on Wednesday, but that have not had time to fundraise. They need $12,000 in 10 days. $12,000 sounds like a lot doesn't it? But, with each of use giving at least $10, it's really not that much! Can you forego a cup of coffee or a fast food lunch this week in order to bring home a new life? Not only that, would you share this with your friends? Email it, Facebook it, Tweet it, Pin it, Stumble it, G+ it. Whatever you can do. And if you're a blogger that might be willing to blog about Merissa's story, please leave a comment below or email Christie and we'll forward you the details! Life is worth it. Adoption is worth it. Let's bring this baby boy home! !